Even stars of ABS-CBN like GMA-7's controversial series, My Husband's Lover! It looks like GMA-7's gay-themed series My Husband’s Lover attracts not only Kapuso fans, but also celebrities from different TV networks. In the said teleserye, Dennis Trillo plays a homosexual named Eric who had a secret affair with Vincent (played by Tom Rodriguez). Carla Abellana is cast as the (previously) unsuspecting wife named Lally. 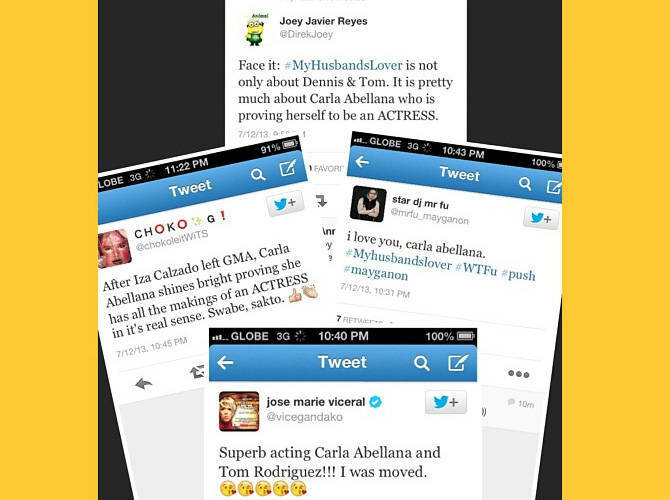 Above, you'll see a photo collage compiled by Carla (via her Instagram account) using screen captures of tweets she received from her ABS-CBN peers. In the caption, she wrote, "What network war? ❤"